Santa Monica is a great choice for shopping and beach activities. Major attractions here are the Third Street Promenade, Santa Monica Place shopping mall, the Santa Monica Pier, Palisade Park, plus the shops and restaurants on Main Street, and also on Montana Avenue. There are miles of beach to enjoy with activities like walking, bicycle rentals, and roller blade rentals. You can take a very enjoyable walk along the beach on a pedestrian path from the Santa Monica Pier to Venice Beach boardwalk in about 30 minutes each way. You can walk northward to Malibu in about 30 minutes, although there is less to see in that direction. The palisade is a long hill with a very steep face - almost a straight vertical drop. It runs along Ocean Avenue north of the Santa Monica Pier, parallel to the beach and Pacific Coast Highway below. Palisade Park is directly on top of the palisade, while the 3rd Street Promenade and Santa Monica Place are nearby. Within walking distance there are literally dozens of restaurants, diners, cafes and food stands, offering every sort of cuisine you could imagine. To get to the beach from here you can walk on an overpass to get across Pacific Coast Highway. Hotel Carmel ($$) 201 Broadway. This hotel is in a VERY convenient location! It is literally a 1-minute walk to the Third Street Promenade, and maybe two minutes to Santa Monica Place. The Pier is just a little farther away. The rates are great for the location. The 3-star hotel has been recently renovated. Ocean View Hotel ($$$) 1447 Ocean Avenue. Three-star hotel with well-appointed rooms and reasonable rates, and conveniently located near the Promenade, Palisade Park, Santa Monica Place and the Pier. Rooms with ocean view and private balcony are available. 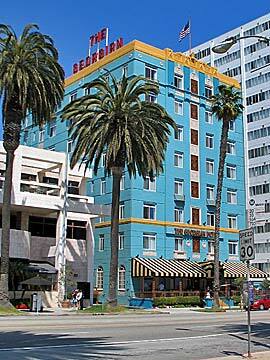 Fairmont Miramar Hotel and Bungalows ($$$) 101 Wilshire Boulevard. Luxurious and secluded, yet convenient to many attractions. Rated at four-and-a-half stars, this is more than just a nice hotel; it is a vacation resort. Large, luxuriously-appointed rooms and attentive staff. Ocean views are available. Within easy walking distance from the Third Street Promenade and Palisade Park. The Santa Monica Pier is about a ten-minute walk away. You can get to the beach on the other side of PCH in less than ten minutes, by using a nearby overpass in Palisade Park. The Georgian Hotel ($$$) 1415 Ocean Avenue. The Historic Georgian Hotel was a celebrity hideaway during the days of early Hollywood. During Prohibition, the art-deco hotel housed a popular speakeasy and is now rumored to be haunted by certain unearthly guests. The Georgian Hotel is within very easy walking distance from the Third Street Promenade, Palisades Park, Santa Monica beach and the Santa Monica Pier. This is an eye-catching hotel; it's very attractive and has a 19th century charm. Hotel Shangri La ($$$) 1301 Ocean Avenue. Four-star Art Deco-style luxury hotel situated in an ideal location - a 2-minute walk to 3rd Street Promenade or Palisade Park. Nearby is a walkway to the beach (an overpass that crosses Pacific Coast Highway). It takes about 5 minutes to walk to the beach, or Santa Monica Place. The Pier is about 10 minutes away on foot. Th I-10 freeway is less than a 5-minute drive from the hotel. On-site dining options include a restaurant, a rooftop bar and lounge, and a sidewalk cafe. There is an outdoor, rooftop pool for lounging, exercise and yoga. Hotels south of the pier are generally closer to the beach and it's easier to walk to the Pier. You'll have easy access to get on the I-10 freeway from here by driving on Main Street to Olympic Drive. Many hotels here are near Ocean Park beach, which is a bit less crowded than Santa Monica beach directly next to the Pier. Santa Monica Motel ($) 2102 Lincoln Blvd. This motel only has a 1-star rating but it costs less than most others, and it's reasonably close to the attractions. It is within a 10-minute walk to Santa Monica Pier, Santa Monica Place, Main Street shops and the Third Street Promenade. You will get some of the street noise from Lincoln Blvd, but you could save $100 a day by staying at this motel. Bayside Hotel ($$) 2001 Ocean Blvd. Clean, modern hotel rooms with a simple elegance, yet the hotel offers affordable rates. It's a two-minute walk to Ocean Park beach, a 10-minute walk to Santa Monica Pier or the Promenade, and a 20-minute walk to Venice Beach Boardwalk. Easy access to I-10 freeway. Casa del Mar ($$$) 1910 Ocean Front Walk. With an entry directly on the beachfront pedestrian path, you are just steps from the where the sand begins, and just a couple of minutes walking distance from the water. This four-star luxury hotel offers well-appointed rooms, many with an ocean view. Separate bedrooms are available, as well as 2-BR, 3-BR and 4-BR suites. Easy walk to Santa Monica Pier and downtown Santa Monica. 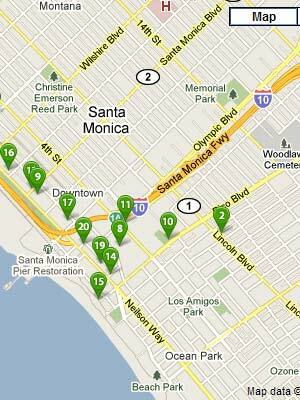 The 3rd Street Promenade, Santa Monica Place and Palisade Park are within a 10-minute walk. Hotel Casa del Mar is next to Ocean Park beach. Shutters on the Beach ($$$) 1 Pico Boulevard. A four-and-a-half-star luxury resort directly on the beachfront walkway, near the Santa Monica Pier. The hotel is distinctive and elegant - you will often see a future bride and groom having their pre-wedding photographs taken on the gazebo near the walkway. Shutters is next door to Hotel Casa Del Mar and within a very short walk from Ocean Park beach. 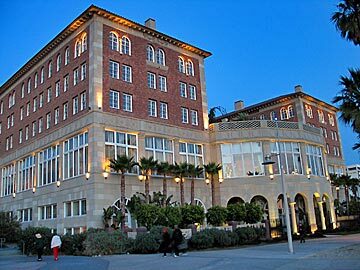 Loews Santa Monica Beach Hotel ($$$) 1700 Ocean Avenue. This four-star luxury resort is a short walk from the beach, the Pier and downtown Santa Monica. You can walk to Santa Monica Place and the Third Street Promenade in about 5-10 minutes on Ocean Avenue. The hotel offers children's activities, connecting rooms (based on availability), a laundromat for guests, 24-hour room service and other amenities. Rooms and suites are available up to 2182 square feet in size. Viceroy Santa Monica ($$$) 1819 Ocean Avenue. Four-star hotel where each room offers a view of the ocean, palm trees or the pool. Very easy access to the I-10 freeway via nearby Main Street. Short walk to downtown Santa Monica, the beach and Santa Monica Pier. Venice Beach can be reached on foot in about a half hour. Luxury Hotels in Santa Monica and other Beach Communities - 5-star and 4.5-star luxury hotels and resorts located in Santa Monica, Marina del Rey and Rancho Palos Verdes.